On Saturday 22 September 2018, activists took advantage of the convening of the United Nations (UN) General Assembly to march from the Chinese consulate in New York to the United Nations Plaza to push for Taiwan’s international recognition as an independent nation. Over the last two years Beijing has increased pressure on Taipei to follow its “One China” policy, preventing Taiwanese representation at international summits as well as continuing to block its inclusion as a UN member. Meanwhile, Taiwan’s government elected to send two ministers as observers to the UN General Assembly where it aims to promote its involvement in human rights and sustainable development. As the United Nations General Assembly convenes in New York, Taiwan, a democracy of 23 million people without U.N. representation, is making its case to be heard. To say it has its work cut out for it would be putting it mildly. China, which insists that Taiwan is part of its territory, is a major power at the U.N., not least because of its veto as a permanent member of the Security Council. Barring seismic political shifts in Beijing, Taiwan won’t be joining the United Nations anytime soon. “Taiwan deserves to have a role in the United Nations, just as any other country in the world,” Taiwan’s foreign minister, Joseph Wu, said in an interview last week. Although Taiwan’s voice is absent from the United Nations, some members do speak up for it. Among them are the 17 countries, including Haiti, Paraguay and the Marshall Islands, that have formal diplomatic ties with Taipei. China refuses to have official relations with any countries that recognize Taiwan. So far this year, it has persuaded three of them to switch their diplomatic ties to Beijing, while putting pressure on airlines and other corporations to stop referring to Taiwan as an independent entity. Taiwan has its own representative government, military, currency and a passport accepted in most countries. That passport, however, is not valid at the United Nations, even for tourists who simply want to enjoy the artwork there. The reasons, as with many curious aspects of Taiwan’s place in the world, can be found in its complicated history. The government of Taiwan, formally known as the Republic of China, once controlled all of China and fought with the United States against Japan in World War II. After Japan’s surrender in 1945, Tokyo relinquished control of Taiwan, which had been its colony for 50 years, and U.S. forces effectively gave the island to Chiang Kai-shek’s Nationalist government, without consulting the Taiwanese people. Because the Republic of China was the first U.N. member attacked by an Axis power, it was given the honor of being the first country to sign the U.N. Charter in San Francisco in 1945. It received a permanent seat on the U.N. Security Council, along with the United States, the Soviet Union, Britain and France. But four years later, when Chiang’s Nationalists lost the Chinese civil war to Mao Zedong’s Communists, they fled to Taiwan. That led to an awkward situation in which his Republic of China government in Taiwan held the Security Council seat while China itself — a fifth of humanity — was shut out of the world body. That lasted for more than 20 years. Until his death in 1975, Chiang was determined to retake China. His unwillingness to accept a two-state solution — in which Mao’s People’s Republic of China would receive the Security Council seat, while his government stayed in the U.N. as Taiwan or Formosa (another name for the island) — culminated in U.N. Resolution 2758, which in 1971 transferred the seat from Chiang’s government to Mao’s. Since then, China has used its clout to block Taiwan’s participation in the United Nations — as well as affiliated organizations that make global decisions on issues like public health and aviation — to induce Taiwan to abide by Beijing’s “One China” principle, which states that Taiwan is part of China. Rather than push for U.N. membership this year, Taiwan has sent two ministers — the digital minister, Audrey Tang, and Thomas Chan, the deputy environmental protection minister — to New York, where the General Assembly convened on Tuesday. Though unable to participate in the assembly itself, the officials are promoting Taiwan’s adherence to the U.N.’s Sustainable Development Goals on the sidelines of the global gathering. “Taiwan’s engagement, even if tangential and unofficial, with U.N. initiatives further underscores its commitment to be a contributing member of the international community,” said Margaret Lewis, a law professor at Seton Hall University School of Law. Though Taiwan was governed by brutal martial law as recently as 1987, it is now seen as a leader on human rights in Asia — a sharp contrast with authoritarian China, where speech is restricted, citizens cannot vote and hundreds of thousands of Muslims have been detained in camps. In 2009, Taiwan adopted the contents of the International Covenant on Civil and Political Rights and the International Covenant on Economic, Social and Cultural Rights as domestic law. Thomas Gold, a professor of sociology at the University of California, said Taiwan was right to take its case to the world. 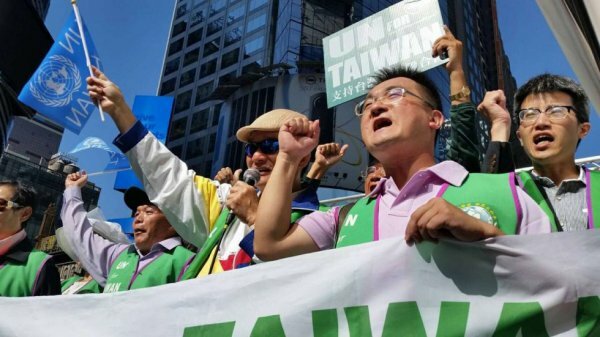 To push Taiwan’s cause, Taiwanese-American advocates for its membership in the U.N. plan to march on Saturday from the Chinese consulate in New York to United Nations Plaza. Mr. Wu said Taiwan’s foreign ministry is working to upgrade relations with “like-minded countries” with which it does not have official ties, including the United States, Japan, Australia, several European countries and Canada. Those countries have also spoken in support of Taiwan at the U.N. and its related organizations.